Bakmi GM, Soekarno Hatta International Airport, Jakarta, Indonesia - my name is Food. 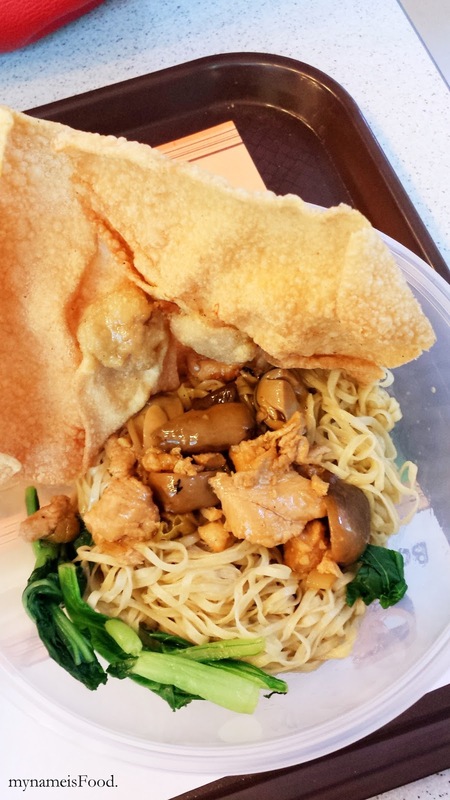 Being one of the most popular Indonesian noodle outlet, dating back from 1959 has continuously dishing out consistent noodle dishes which until now has not lost its taste and history. They do offer non-noodle dishes such as Smoked Chicken rice or Chicken and Mushroom rice etc. Though their most popular dish would be their Fried noodles with various toppings depending on what you choose. While waiting for a flight in Jakarta, I decided to have a quick meal before taking off and what better place to have a quick meal than here.. Note that this is a delayed post as now the new Terminal has been rebuilt and replaced entirely. 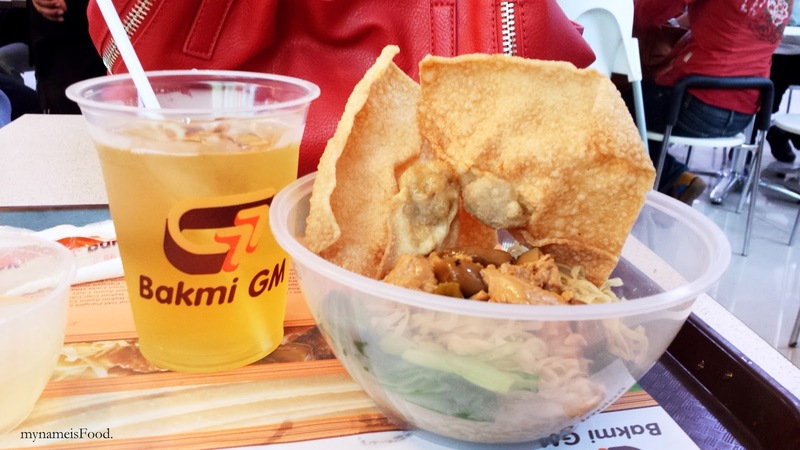 'Special Bakmi GM Pangsit Goreng (Special Fried Noodles GM Fried Wonton)' (IDR28.182k = ~AUD$2.8) with 'Ice Tea' (IDR5.909k = ~AUD$0.59) was what I had which also included a wonton soup. This particular dish had egg noodles slightly drizzled with sesame oil topped with veges and pan fried chicken and mushrooms and since I ordered the combo with the Fried Wonton, I received 2 pieces of them. You can order just the original noodle dish or any other dishes and add extra fried wontons or boiled wontons or beef balls etc on the side. Usually if you do come and dine here in a group, it is usually better that way as you do get more value for your buck if you just order a side of Fried Wontons as you get a few pieces per serving. Yes, it is a very simple noodle dish but when you do mix it altogether, you realise that sometimes the most simple things in life are just simply the nicest. 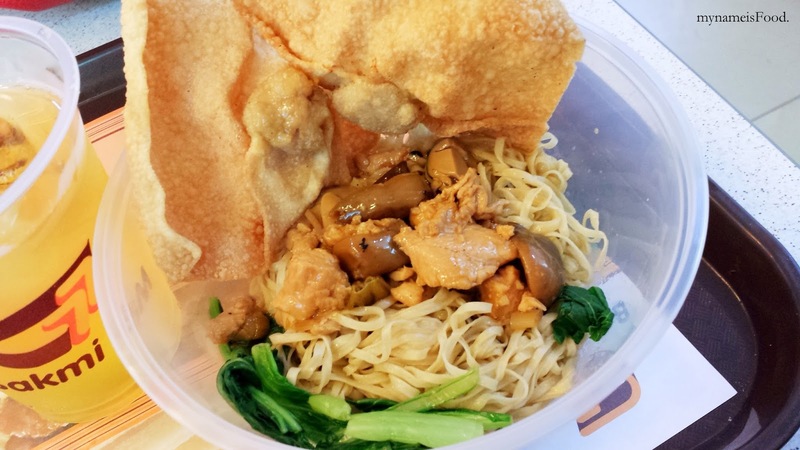 The combination of the soy based pan fried chicken and mushrooms blended in well with the egg noodles. Remember to pour some of the wonton soup into the noodle bowl to give it that extra saucyness, absorbing the broth as well as it allows the sesame oil as well as the leftover soy from the chicken and mushrooms to combine to make a base that has more of a punch and of course, makes the egg noodles less dry.